India After Gandhi: The History of the World's Largest Democracy focuses on the significant events in the history of India which highlight the core of its past and present, its politics, culture and society. The chapters in the book deal with the struggle which India faced post almost a century of colonization, the components of Indian culture, the return of caste and the revival of religion and the effects of war and globalization. The book is also concerned with providing insights into the life of India's first Prime Minister, the troubled times of emergency during Indira Gandhi's regime, the liberation of Bangladesh and the lives of farmers, musicians, tribals and workers. 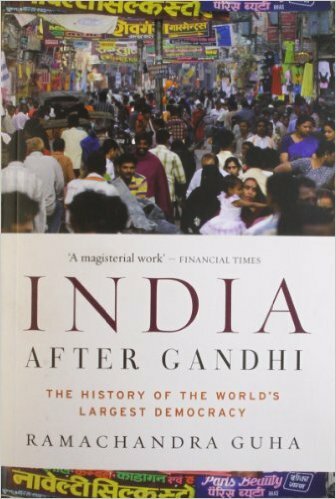 India After Gandhi: The History of the World's Largest Democracy meticulously describes how a country plagued by the evils of discrimination in terms of caste, creed, religion and language rose to form the world's largest democracy. A detailed account of events that shook the foundation of India and the events that helped in joining the broken pieces together is given in this thoroughly researched and well written book. The book was first published in the year 2007. It is available in paperback and the publisher is Picador. This Indian ed edition was published on 14th August, 2008. Born against a background of privation and civil war, divided along lines of caste, class, language and religion, independent India emerged, somehow, as a united and democratic country. Ramachandra Guha’s hugely acclaimed book tells the full story - the pain and the struggle, the humiliations and the glories - of the world’s largest and least likely democracy. g country in the world, it is also the most interesting. Ramachandra Guha writes compellingly of the myriad protests and conflicts that have peppered the history of free India. Moving between history and biography, the story of modern India is peopled with extraordinary characters. Guha gives fresh insights on the lives and public careers of those longserving Prime Ministers, Jawaharlal Nehru and Indira Gandhi. But the book also writes with feeling and sensitivity about lesser known (though not necessarily less important) Indians - peasants, tribals, women, workers and musicians. Massively researched and elegantly written, India After Gandhi is a remarkable account of India’s rebirth, and a work already hailed as a masterpiece of single volume history. India After Gandhi was chosen as the Book of the Year by the Economist, the Wall Street Journal and Outlook, among others. The book won the Sahitya Akademi Award for English in the year 2007.